Chicago is one of the most exciting towns I know. It has a huge energy to it and a purpose. Yet as bustling as the people are, they are as friendly as Southerners to strangers. [Sunday] We had planned our trip meticulously, knowing that we had a 3 ½ year old to keep happy, as well as 4 adults [I consider this about the right ratio]. So, upon arrival, we took a taxi right to the Blake Hotel, a fairly high priced but enormously convenient place. The rooms turned out to be quite spacious and nicely done. And they agreed to store our bags on both sides of the trip, a truly great service. Check-in done, and rooms guaranteed by credit, Ron and I set out on foot [known as “shank’s mare” in Britain] to the Chicago Institute of Art. The collections are along the lines of the Met in NYC, though vastly more modest: paintings, sculpture and decorative arts for the most part. 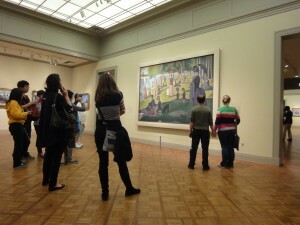 The main claims to fame are “Sunday on the Grande Jatte” by Georges Seurat; American Gothic” by Grant Wood and “Nighthawks” by Edward Hopper which was not on display. Other works, esp. those by van Gogh and Monet are justly famous. As usual, we bought the guidebook first and made our way through the rooms, reading about some works [which helps understand the art considerably]. We also like to check mark the ones we saw so that in years to come we might—might—remember a fraction of what we have seen. We finished up in time to reach the hotel by 5ish, greeted our beloveds [TAZ = Theresa, Andrew and Zoe] and then we all rested a while. For dinner at Gino’s, we hosted Theresa’s sister-and-husband and cousin-and-girlfriend; it was a large and noisy group, with Zoe being the very queen of the table. We had wonderful Chicago deep dish pizza and roasted Brussels sprouts, among other yummy things. Gino’s also is a micro-brewery, so Ron and Andrew taste-tested a goodly number of samples. They have very different palates—a surprise to me for some reason. Chicago claims to have “the first buildings that scraped the sky”, but the term “skyscraper” originally referred to clipper ships, with their huge masts. Louis Sullivan and Associates invented the tall building, originally very thick at the base with reinforced masonry, which eventually developed into the steel exoskeletons, covered in glass, that we see today. Thus enlightened and exhausted, we picked up some Japanese food and returned to the hotel for rest. Poor Andrew had to work some [yes, even on vacay [IMO he runs the company]. 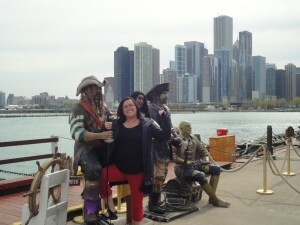 Refreshed, we took a cab over to the Navy Pier, supposed to be kid-friendly. The Children’s Museum is there [RAZ went] and some shopping [TC tried, but nothing worth buying], but most of the pier is under reconstruction. 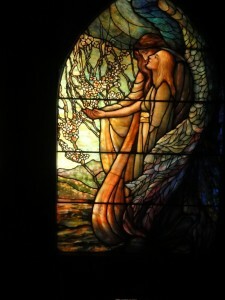 TC found a wonderful display of rescued stained glass from demolitions all around the city. 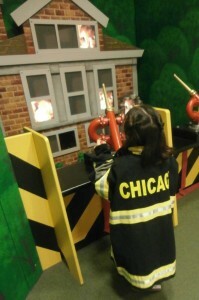 Zoe not only rescued the city from fire, but also cooked dinner for R&A and in general had a blast at the museum. We all gathered in a large, glass-enclosed palm court with fountains so that Zoe and Carol could play and the others sit down. Lots of photos ensued and all pockets emptied of pennies—we even shared with 2 other little girls. While returning by bus to the hotel, we passed the shopping district, and TAZ jumped off the bus to get leggy Zoe some new trousers; she kept mooning everyone while riding on Andrew’s shoulders. Tuesday we bussed over to the Shedd Aquarium. 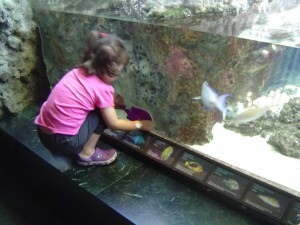 Andrew and I have always loved going to Sea World etc and making snarky comments about the fish [while really enjoying learning stuff] and he has made sure Zoe continues the tradition. I had brought a small plush ray to give her and I was dismayed that the touch-a-ray tank was closed. Fortunately my gift was vindicated by many rays in tanks. The highlights of the Shedd for us were tidal pools touching tanks; playful river otters; beluga whales and many tanks of jellyfish. We got to see a diver feeding the critters in the huge central tank by virtue of having collapsed on a bench before he got started. After naptime, TCZ got on the bus and went to The American Girl Place, where we scarcely had enough time. Zoe loved that place, esp where they had set out tea sets and beds to play with. I hated to, but we had to keep moving her along. 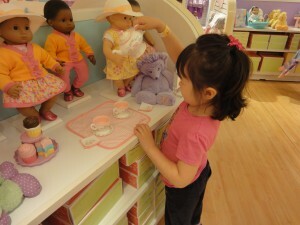 Theresa got a chance to pick out the Bitty Baby doll she wanted for Zoe [refusing my offer to get an American Girl for herself] and I added the play cookies, 3-part cupcakes and epergne Zoe had played with. I got my Girl a Chicago t-shirt; she also has NYC and LA. This completed something of a pilgrimage on my part, in memory of my mother and sister, who never got to go except for pretend.